In 2000 I developed an original style of table-top hand puppetry as I had wanted to make superhero characters with normal human proportioning, rather than the traditional cartoon-like hand puppet shape. 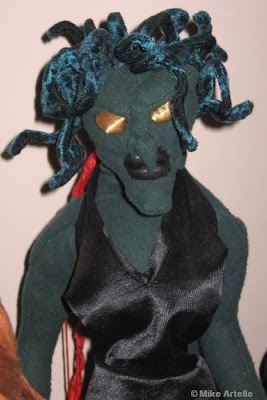 Over a period of five years I built roughly 20 of these puppets, which have detailed soft sculpting. 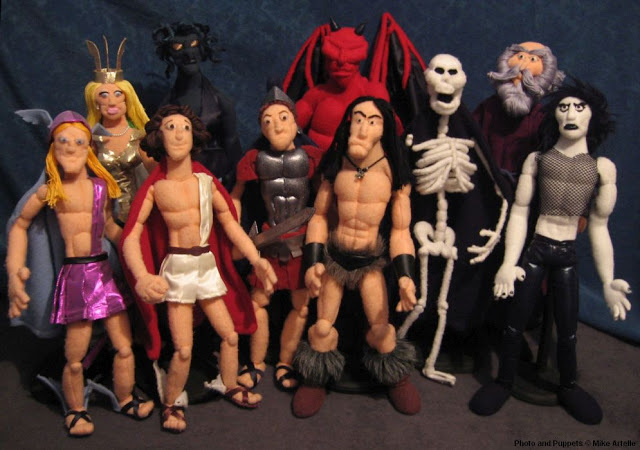 Although parents aren't supposed to have favourites, the puppet that I like best among this group is Pythor the Barbarian. He's the one in the middle with the fuzzy underwear and mighty abs! Unfortunately I didn't get very far with my marionette project as the stringing and jointing is very technical, though I still wanted to make puppets with natural human proportions like a marionette. Therefore, I combined elements from both hand puppets and marionettes to create a new style of hand puppet that can be performed on a table-top stage, as shown below. 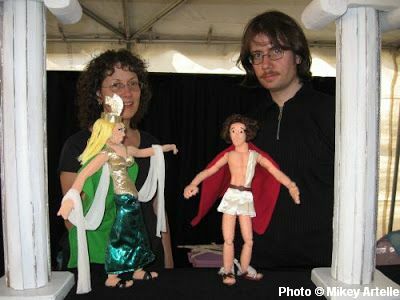 My "Hand Puppet Heroes" can also be performed in a traditional hand puppet booth, but they are best suited for a mini puppet stage. 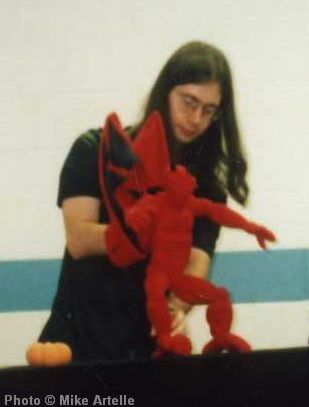 The first time I performed my new hero puppets for an audience was at a Halloween themed members meeting of the Ottawa Puppetry Club in 2000. Puppeteers David and Muriel Smith attended from Kingston and performed a short show with their skeleton marionettes called Dance Macabre. Puppeteer Johan Vandergun was also there from Toronto. (In the 1970's Johan had built the puppets for two of my favourite childhood TV shows, The Hilarious House of Frightenstein and Waterville Gang!) My bizarre puppet skit was set to music and involved Pythor, Boris the Demon (shown here) and a skeleton fighting over some pumpkins. I'm not actually sure what the skit meant, it was just weird for the sake of being weird. 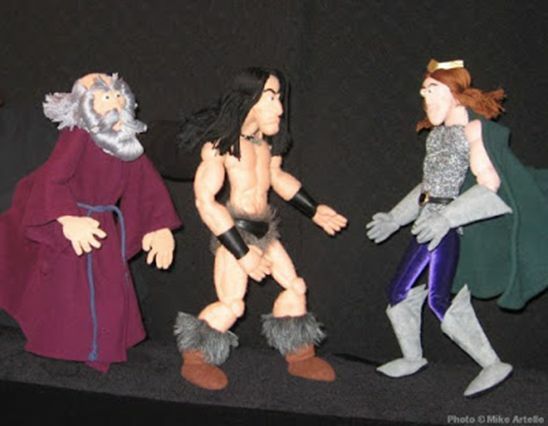 In 2006, after roughly five years of development with my new hero puppets, I created a 45 minute puppet show titled "Heroes Past and Present" which consisted of three short stories. The first story was a Greek myth about Perseus and Medusa. This was followed by two stories featuring my own original heroes including a medieval fantasy story about Pythor the Barbarian, and a modern day superhero adventure with Canadian Crusader. 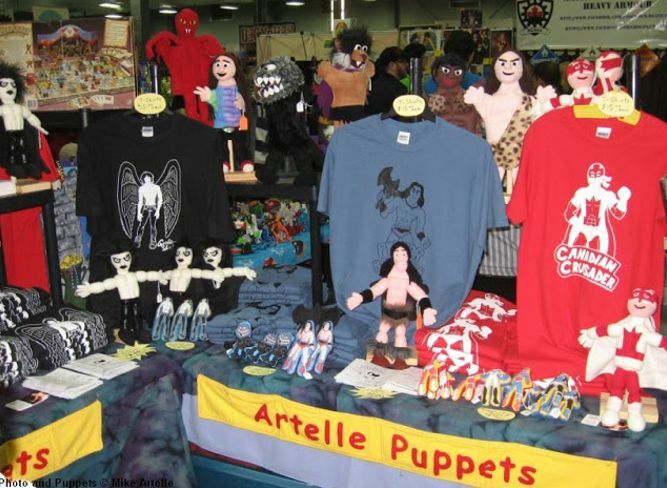 The show premiered in August 2006 at the Puppets Up Festival in Almonte Ontario. The Arlyn Award was created in honour of Arlyn Coad shortly after her passing in 1999. Arlyn and Luman Coad are two of Canada's most renowned puppeteers who have performed all over the world. Together they founded Coad Canada puppets during the mid 1960's. 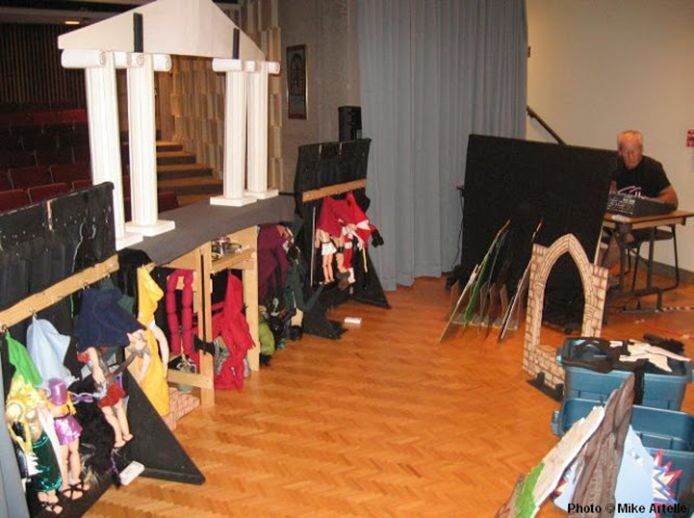 Their company has toured Coad Canada puppet shows nationally and internationally ever since. In 2009, the year after I had received the Commendation, Luman Coad brought an original Coad Canada Puppets production to the Puppets Up festival as a featured performer, so I took the opportunity to get this photo taken with him and the commendation award. As Coad Canada Puppets is based in Vancouver I had never met Mr. Coad before, so I'm forever greatful that the Puppets Up festival made this meeting possible. 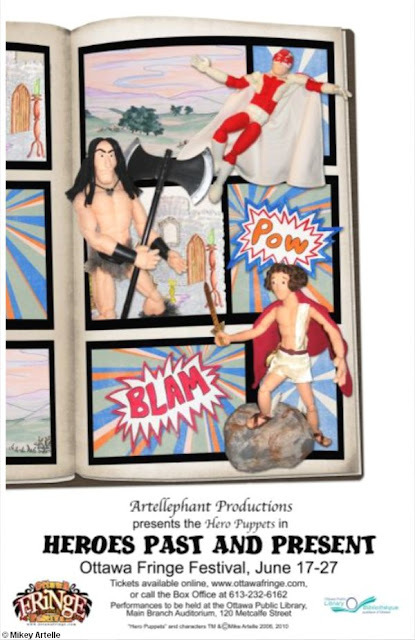 By 2008 I had revised the Perseus story from "Heroes Past and Present" to be it's own 45 minute show, adding in some scenes. In addition to other locations, I performed this show at the Canadian Museum of Civilization while they were hosting an exhibit about Greek culture, complete with ancient Greek artifacts! In the audience were groups of students who had just toured the exhibit. 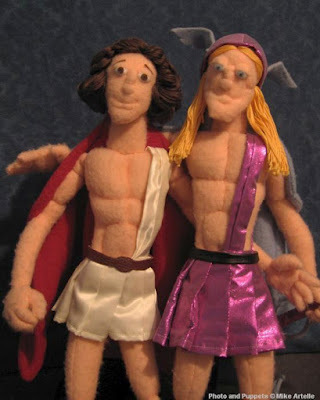 Here's a cute photo of Perseus and Hermes, characters from "Perseus and the Gorgon Medusa". My version of Hermes is a "surfer dude" type of character. After he helps Perseus with the quest he departs by saying "I must be off for there are other mortal brothers who totally need my godly assistance. Later Perseus dude! ...and hey, after your adventure gimme a holler 'cause I'm havin' a wicked toga party man, it's gonna be huge!" 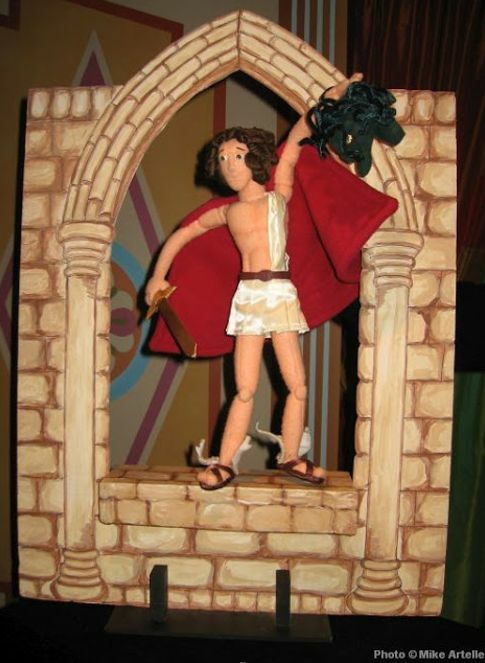 Shown here is one of the new scenes for the Perseus show when he flies in through the window of the evil King Polydectes' castle and then holds up Medusa's head to turn the King into stone. Here is a closer look at the evil Gorgon Medusa! 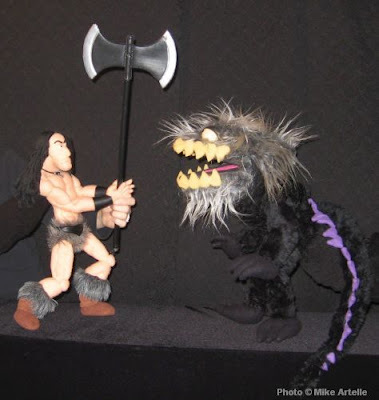 The second short story in "Heroes Past and Present" with Pythor the Barbarian was performed separately for the Ottawa Puppetry Club's annual variety show. This segment is titled "The Quest for the Ogre's Emerald". Above is the first scene in which Pythor the Barbarian confronts the evil Burgle Beast! The next scene introduces Doomstrike the Wizard and Prince Boldheart. Later, Pythor meets Vul-Gar the Ogre. Vul-Gar is made out of the same green fur as my Ned the Nasty Troll puppet character (seen on the The Fuzzy Gang and Past Shows pages of this blog). 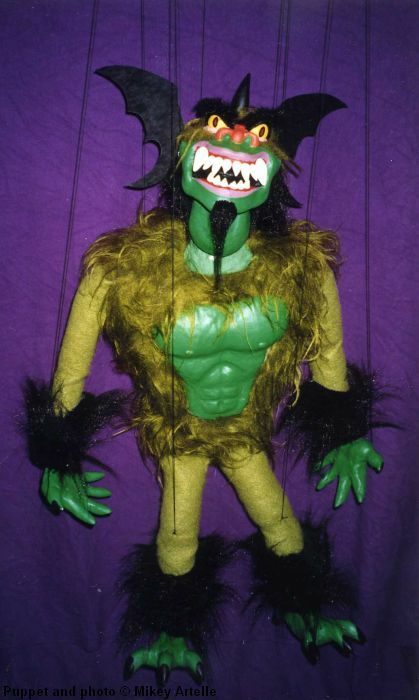 The first Vul-Gar puppet was made in the late 1990's as a marionette for a music video project, shown above (see the Special Project page for more info). This puppet has a delicate clay face so it wasn't suitable for converting into a hand puppet for "Heroes Past and Present". Therefore I built a new soft sculpted version which is seen above with Pythor. 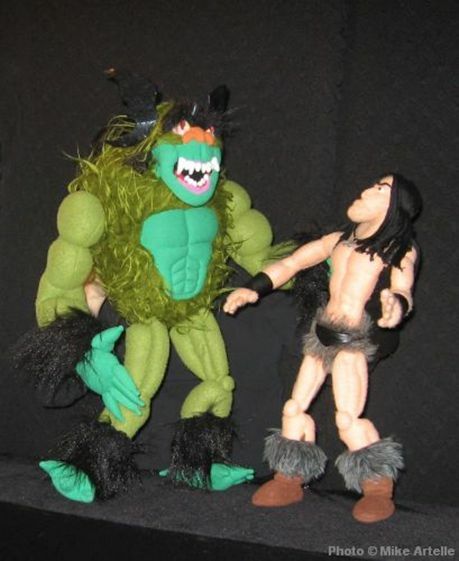 As I had used up what was left of the green "Ned the Nasty Troll" fur to build the original Vul-Gar puppet, I used the fabric from Ned the Nasty Troll's body to built the second version of Vul-Gar, so now Ned is just a head! 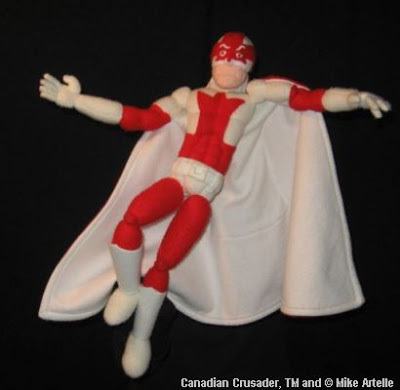 The final story from "Heroes Past and Present" features my patriotic superhero Canadian Crusader, protector of the True North! Canadian Crusader's story has only been performed as the third act following the above two stories, rather than as a separate show, as it requires some continuity. It involves having all three heroes from the different time periods (shown above) join together to defeat the villainous Icicles Man (shown below). I found the story with Canadian Crusader was actually the funniest and most interesting story from the entire Heroes show. The scene in which Canadian Crusader, Perseus and Pythor the Barbarian finally all meet each other for the first time is shown above. Pythor asks "Why does Canadian Crusader wear his under garments on the outside of his breeches?" to which Crusader responds "In the future, superheroes wear spandex to save the world!" Here's the climatic and comical battle scene in which Canadian Crusader defeats Icicles Man. Before the battle Crusader exclaims "It's time to melt your madness!" This is the poster for the performances of "Heroes Past and Present" that I did as part of the Ottawa Fringe Festival in 2010. Here's a behind the scenes look at our stage for Heroes Past and Present. This photo was taken in 2010 during our run at the Ottawa Fringe Festival. Everything had to be meticulously set in place. It was especially important to hang the puppets on the correct side of the stage as they had to be in reach when needed during the show. My father Robert is seen in the wing, ready with the sound equipment. 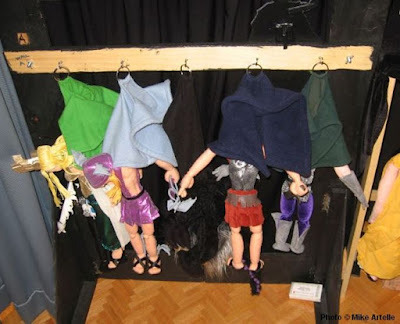 A closer view of the puppets hanging backstage: Here we have Athena, Hermes, Burgle Beast, Roman Guard and Prince Boldheart. In 2014 I began working toward publishing my own comic books based on the "Heroes Past and Present" show and other superhero characters. 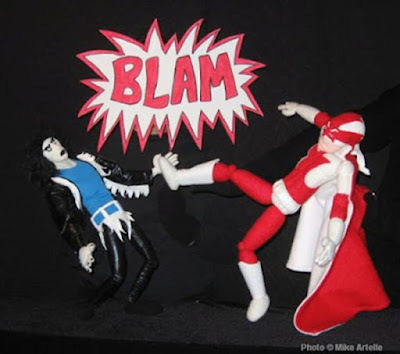 The following year I launched my new comic book brand Pythor Comics. 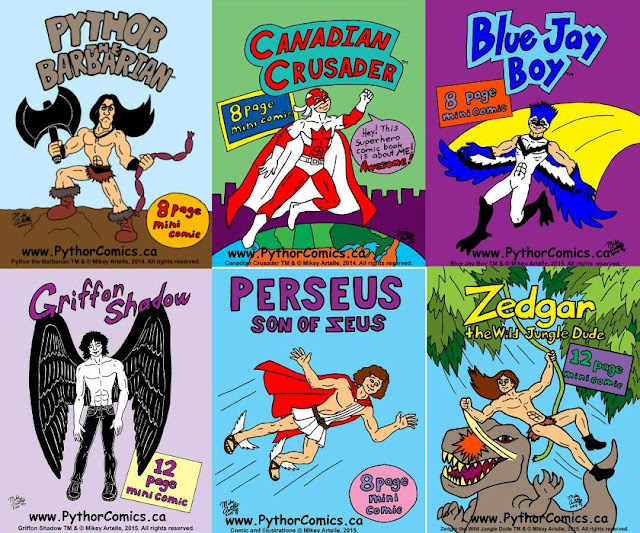 To date I've created five mini comics: "Canadian Crusader", "Pythor the Barbarian", "Perseus, Son of Zeus", "Blue Jay Boy" and "Griffon Shadow". The comics can be read for free on the Pythor Comics Superheroes Mini Comics page of this blog, or on the official Pythor Comics website. New mini comics will be posted every so often, so please come back for more! Pythor the Barbarian and his mighty abs! 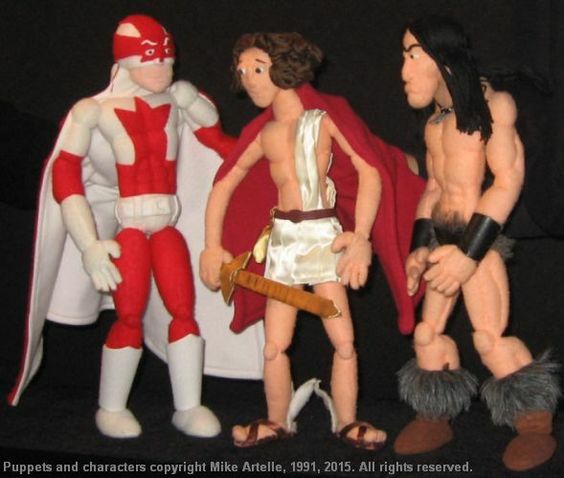 Over the years I've enjoyed presenting my "Hand Puppet Heroes" to kids and adults alike. 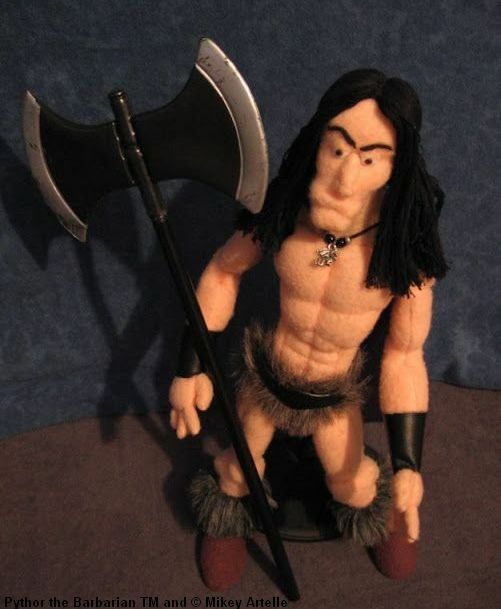 One of my favourite moments occurred around 2003 when I showed Pythor the Barbarian (above) to a punk-rocker guy who was in his late teens or early 20s. Unfortunately I didn't get his name, but he had a Mohawk, spikes on his jacket, and the whole "tough guy" look. The instant that he saw Pythor his attitude disappeared and his face softened with an expression of complete awe. He instinctively reached toward Pythor to take the puppet off my hand, and in a child-like trance he put the puppet on to try it for himself. He enjoyed Pythor so much I began to worry if I would get the puppet back! To know that I can make a puppet that can get that kind of a reaction from such a rebellious looking dude is pure magic!